New Liturgical Movement: Why is the Feast of St Matthias Moved in Leap Years? Why is the Feast of St Matthias Moved in Leap Years? A reader wrote in to ask why, in the traditional rite, the feast of St Matthias the Apostle is moved from February 24th to the following day every leap year. The answer lies in the very ancient Roman calendar, which is still part of the Church’s liturgy to this day; it is used in the calendars printed at the beginning of the Missal and Breviary, and in the Martyrology, the names of the days are still read out according to the Roman system. In the Roman calendar, each month has three days which are called the Kalends, Nones and Ides; the first of these three is the first day of each month. In March, May, July and October, the Nones are on the 7th, and the Ides on the 15th; in all other months, they are on the 5th and 13th. These designations probably arose, like most features of most calendars, from some sort of religious observances fixed to those days, perhaps connected to a very primitive lunar calendar, but we know nothing for certain about their origin. The Romans named the days of each month by counting backwards from these three points. Thus, Julius Caesar was killed on the day which we call March 15, but which they called “the Ides of March”; their name for the 14th was therefore “the day before the Ides of March.” As every Latin students knows, this system becomes difficult to keep track of because the Romans counted inclusively, not exclusively; therefore, the day we call “March 13” was called “three days before the Ides of March”, (not “two days before”), including the day itself, the day before the Ides, and the Ides themselves. We can only assume that this system is not an example of complexity created for complexity’s sake, and that it served as a way of counting down to and preparing for whatever religious observance was connected to the three points. Pilgrims venerating the relics of St Matthias the Apostle in the crypt of the abbey named after him in the German city of Trier. He is commonly said to be the only Apostle whose relics are kept anywhere north of the Alps, but the Roman Basilica of St Mary Major also has relics venerated as his since the beginning of the 11th century. 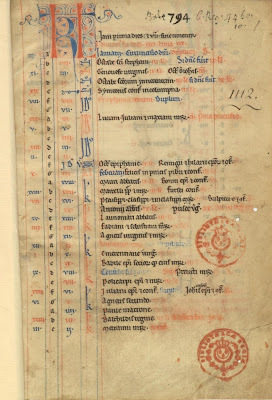 When the feast of St Matthias came into the Roman Rite sometime between the 9th and 11th centuries, it was fixed to this “sixth” day before the kalends of March, which we call February 24. The precise reason for this choice is unknown, but it is surely not mere coincidence that nine other months have the feast of an Apostle or Evangelist within their last ten days, thus distributing them more or less evenly through the year. In a leap year, when there are two such days, Matthias’ vigil is kept on the first of the two, and his feast on the second. Thus, although his feast is transferred on the modern calendar, it remains in its place on the Roman calendar. This also applies to the feast of St Gabriel of Our Lady of Sorrows, which is kept on the 27th in a regular year, the 28th in a leap year; in both cases, his feast is on “tertio Kalendas Martii” on the Roman calendar. The same would apply to any local feast occurring between February 24 and 28. The backwards reckoning of the Roman Calendar is also relevant for the dating of the Nativity of St John the Baptist, one of the most ancient of all the Church’s feasts, as it relates to the Birth of Christ. Its date is determined by the words of St. Luke’s Gospel that John’s mother Elizabeth was six months pregnant at the time of the Annunciation. It is kept on June 24th, however, where Christmas and the Annunciation are kept on the 25th of their respective months, because on the Roman calendar, all three feasts are on the “eighth” day before the Kalends of the following months. In the post-Conciliar calendar, St Matthias has been moved to May 14th, so that his feast may occur roughly after the Ascension, since the very first thing the Apostles did after the Ascension was elect him to replace the traitor Judas. Easter can occur within a range of 35 days, from March 22 to April 25. So in point of fact, on the first five days of this range (March 22-26), St Matthias’ new feast day will occur on or after Pentecost; on the last 21 (April 5-25) it will occur on or before the Ascension. This may seem to make the transfer of St Matthias’ day highly illogical; however, the occurrences of Easter are not distributed evenly over this range. The earliest date, March 22, has occurred only four times since the Gregorian Calendar was instituted in 1582, and will not occur again until 2285; the latest date comes only once a century. Factoring in the lamentable and lamentably widespread custom of celebrating the Ascension on Sunday, St Matthias’ feast occurs after it roughly 40% of the time.